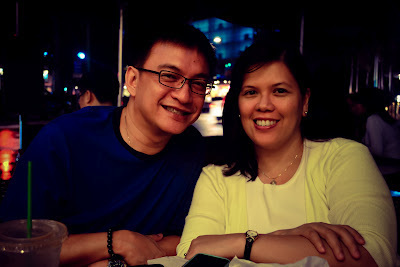 We celebrated my friend Melanie's birthday last week by going to our favorite videoke place. Our friends made the reservations and I went out to buy the cake for her. It was a lovely and tasty cake from Sugarhouse (Midnight Chocolate Cake). We obviously all love to sing and to eat so it's really a no-brainer when it came into deciding how we would want to celebrate. And so we rounded up our (their) favorites: Rhianna, Lady Gaga, Katy Perry, Celine Dion and many other current and old hits. Here's our group picture: myself, Cha, Mel, Sam and Thea.We ordered pizza, buffalo wings, nachos and drinks. They've been trying to learn how to stop drinking so the alcoholic drinks were at a minimal level (I didn't drink but just ate lots, hahaha). Here's us really getting in the mood to sing and dance. And I still remember this time - we were singing "Stop" by the Spice Girls but was so bad at the choreography! Oh well, maybe next time we will come more prepared. I've been neglecting this blog for some time (coz I'm secretly hooked on IG). But am taking a minute to post this recent photo of me and my ex-boyfriend. Hahaha. It's October and we are celebrating our anniversary once again. Thanks to Nina for the pic!